BIG BONUS in this recipe… no waiting! You do not have to chill the sugar cookie dough before you roll and cut! The dough is very easy to work with- if too sticky just add a bit more flour, and it’s able to take rolling and re-rolling without getting dry and worn out. The Meyer Lemons give these cookies just a tinge of lemony flavor. If you don’t wish to use Meyers, I wouldn’t sub regular lemons (too tart), but you can skip the juice & zest in the recipe and sub vanilla or almond extract in its place. I used ‘gel-paste coloring’ to tint my icing. If you’re a frequent baker and you don’t have any of these, you should think about getting them (again, Michael’s or a baking store). There are so many cute colors, and just a tiny little bit will give you the color you need. They last forever. 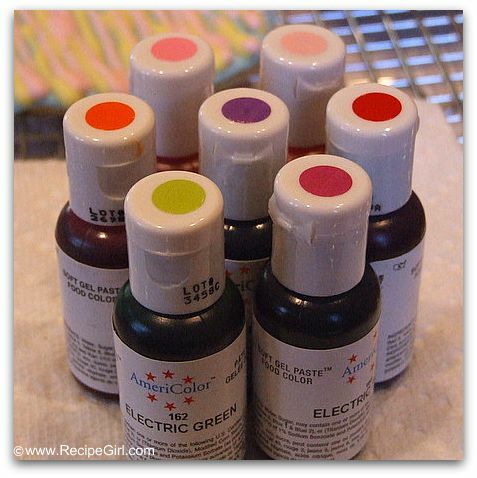 You can certainly use regular food coloring instead if you don’t have gel-paste. I got out a bunch of little plastic containers w/ lids, divided the icing between them and tinted my colors in those. For icing, I used the little zip snack bags (nothing fancy!) Just put the tinted icing in the baggie and very carefully snipped of the very tip of the baggie & squeezed away. 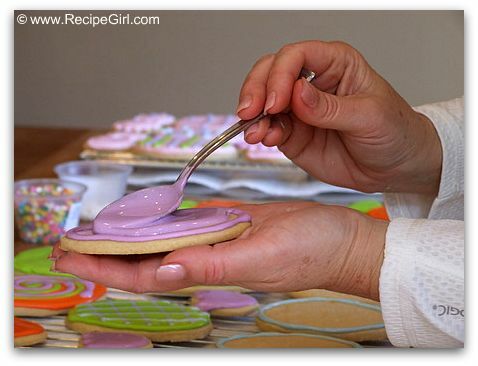 I used the squeeze baggie to do all of the edging on the cookies, then set it aside and spooned the icing from the container on top to ‘flood’ the center of the cookie. 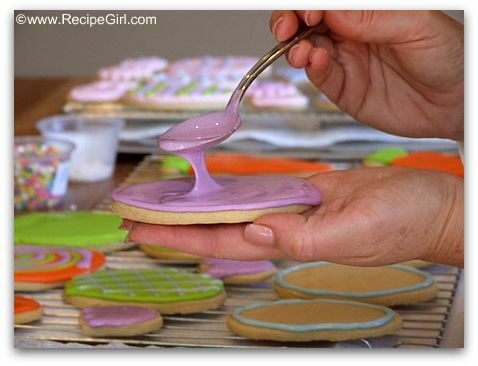 You have to keep the icing covered or it begins to dry out and get too thick. If it’s too thick, just thin it out with a few added drips of water. 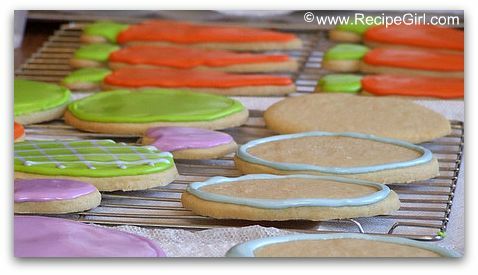 After I had all of my cookies flooded with their base color, I used my squeeze baggies to do all of the decor and added a few sprinkles here and there. Note: I’m lucky enough to have a Meyer Lemon tree, but sadly it isn’t producing any gems yet. The Meyer Lemons in this recipe were found at Specialty Produce. Wow, so pretty Lori! They look like professional cookies, nice job!! I’ve had cut-outs on my mind all week. I must make some for Easter! So glad to have this recipe. Yours look lovely. I have two dwarf Meyer Lemon trees and I’m patiently waiting for them to start bearing fruit. I can’t wait! Oh goodness, these are darling! You must have incredible patience. The meyer lemon sounds incredible and gives me a great idea what to do with all the ones ripening on my tree. 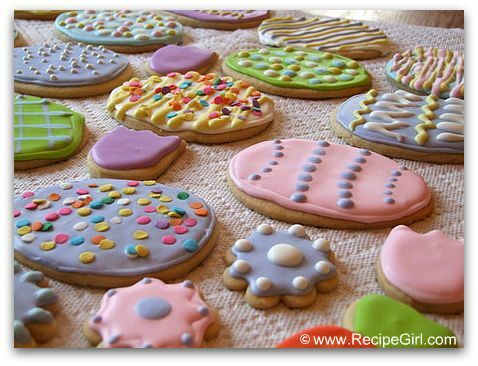 So cute and beautiful cookies! you have some great skills to do so carefully! Nicely done and awesome photos, thanks for sharing! I baked these cookies today for a bridal shower this friday. I just used a wedding dree cut out shape instead. Such a great flavor! Thanks so much for the recipe! Wow! These look so lovely! I love all your decorations! How adorable – such lovely colors! Happy Easter to you! 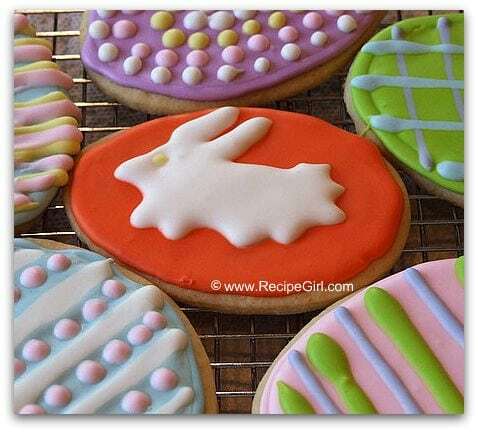 A no chill cut out dough, have got to try this one.. you decorated them beautifully.. Very cute! Actually, I found myer lemons for the first time recently. I think they’ve just come to my city because I have looked for them before. What lovely cookies! They look so perfect! These are awesome! Love those carrots! 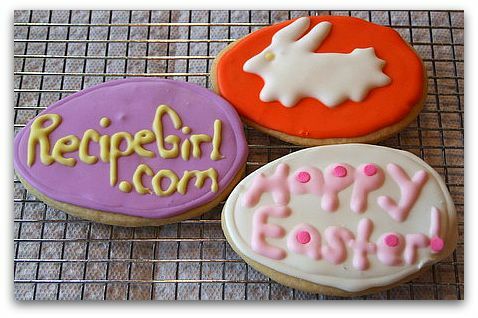 Oh I usually always make sugar cookies for Easter and haven’t yet. Sigh. 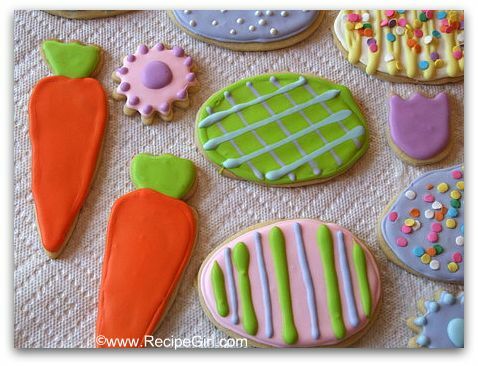 Spring cookies, there you go. I can still do it! These look awesome. Beautiful! You have mad, hot decorating skills- I’m jealous. Thanks for sharing the recipe; I have Meyer lemons hibernating in my refrigerator.